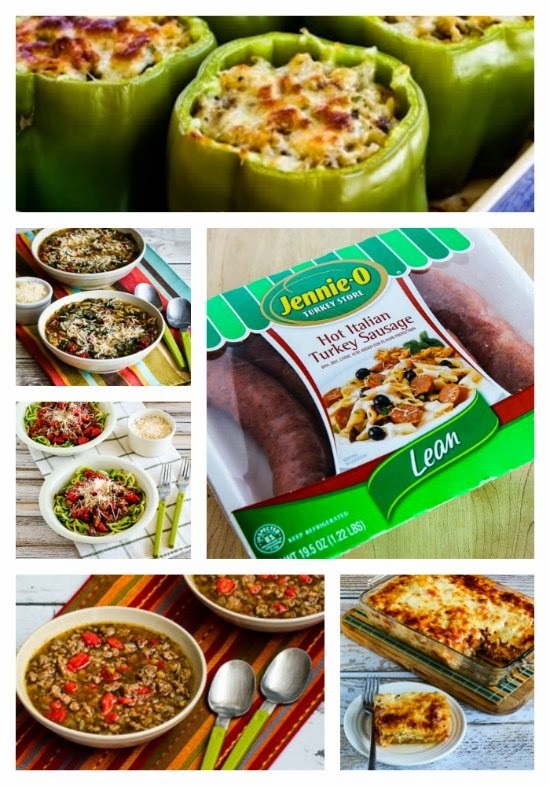 There’s no doubt that hot or sweet Jenni-O Italian Turkey Sausage is one of my favorite ingredients! I like to share ingredient recommendations and kitchen picks occasionally, and with the new blog design you can find those picks under the More from Kalyn section in the row of tabs. Today I’m gushing about Jenni-O Italian Turkey Sausage, and if you enter “turkey Italian Sausage” into the search bar on Kalyn’s Kitchen, you’ll find 2,200 results, which tells you how fond I am of this sausage! This versatile turkey Italian Sausage is one of my first choices to grab from the freezer when I need a quick dinner, and I’ve made so many of my favorite recipes using it. I’m a fan of both the Jenni-O Hot Italian Turkey Sausage and the Jenni-O Sweet Italian Turkey Sausage, but if you’re not cooking for kids, the slightly spicy Hot Italian sausage is the one I like best. Honestly, I have no idea why it’s taken me so long to feature Jenni-O Italian Turkey Sausage as one of my picks, since I use it so often and have so many recipes that include it, but I’m finally making it one of my Kalyn’s Kitchen Picks and giving it the attention it deserves. Of course this sausage is fantastic with pasta of any type, but I’ve also made a lot of low-carb dishes using it. Here are 20 of my favorite recipes with Italian Turkey Sausage; I hope you’ll enjoy trying some of them. And if you’ve already made some of these, I’d love to hear in the comments about how you liked them or other ways your family enjoys turkey Italian sausage. This Low-Carb Mock Lasagna Spaghetti Squash Casserole is a dish where the flavor of the sausage really shines! 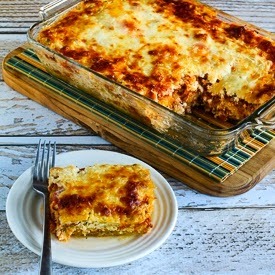 Low-Carb Sausage and Kale Mock Lasagna is a casserole that has layered kale, sausage, tomato sauce and cheese, and this has been a hit with everyone I’ve made it for. 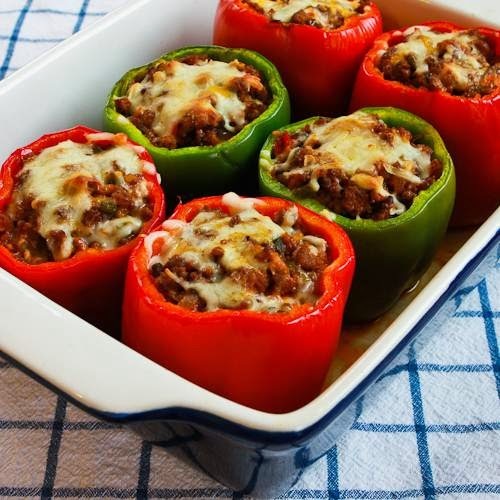 Low-Carb Stuffed Peppers with Turkey Italian Sausage, Ground Beef, and Mozzarella is a favorite stuffed pepper recipe I’ve been making for years. 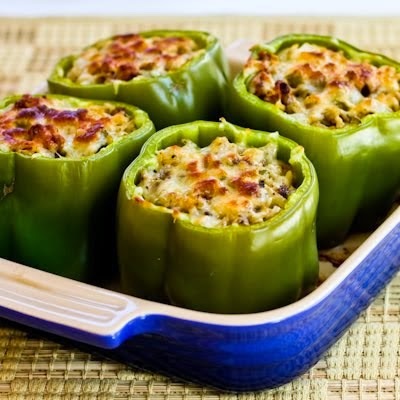 These peppers don’t have rice and this recipe is low-carb and gluten-free. 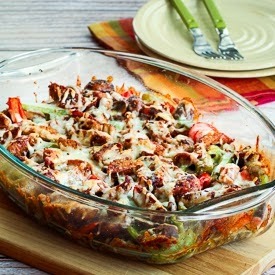 Sausage, Peppers, and Mushrooms Low-Carb Cheesy Bake is one of my newest recipe ideas using Italian sausage, and we gobbled it up when we tested the recipe! 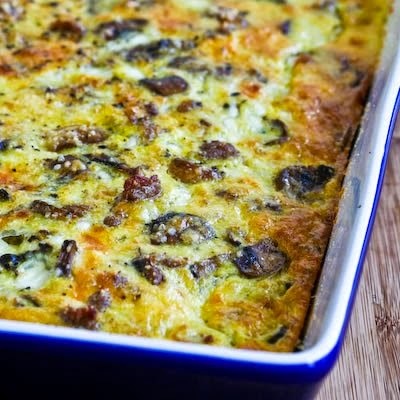 This Breakfast Casserole with Sweet Italian Sausage, Mushrooms, and Cheese was so delicious it made me wonder why it had taken me so long to try Italian sausage in a dish like this. 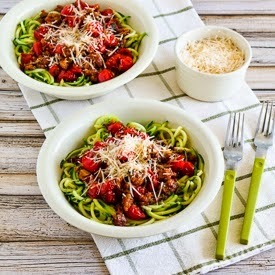 I’d never get tired of these Zucchini Noodles with Spicy Cherry Tomato, Sausage, Garlic, and Herb Sauce. 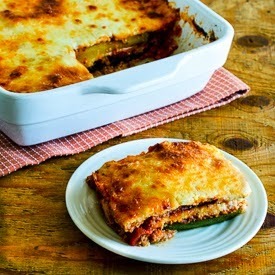 In the fall when you get those giant zucchinis, I love this Grilled Zucchini Low-Carb Lasagna with Italian Sausage, Tomato, and Basil Sauce that uses big slices of zucchini instead of pasta. 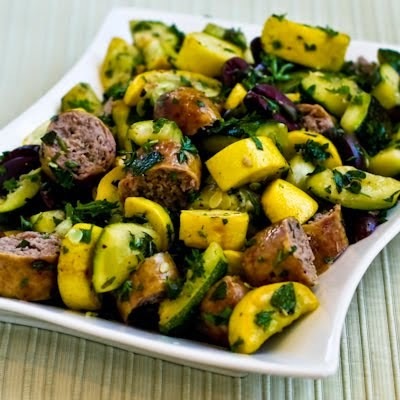 Grilled Sausage and Summer Squash with Herbs, Capers, Kalamata Olives, and Lemon has so many of my favorite flavors in a quick summer dinner. 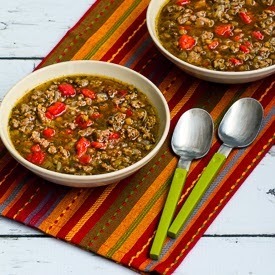 Lentil Soup with Italian Sausage and Roasted Red Pepper has a lot of sausage and peppers to keep the carb count low, and this soup is delicious! 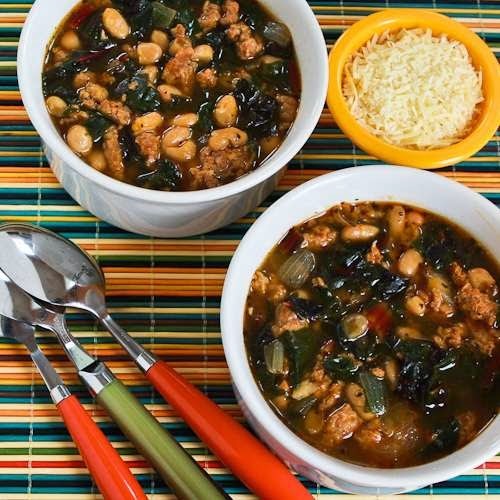 Italian Sausage and Bean Soup with Chard is tasty for a quick week-night dinner. 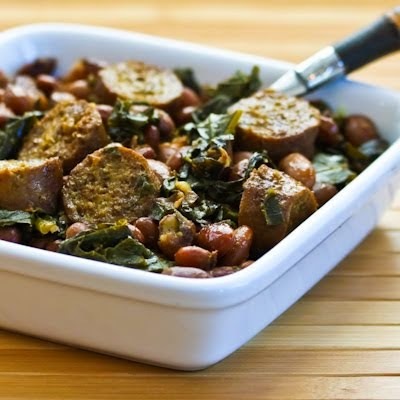 CrockPot Sausage, Beans, and Greens is not all that photogenic, but it’s delicious! 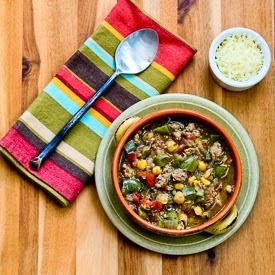 Italian Sausage Soup with Green Pepper, Chickpeas, and Pesto is another soup that has a lot of sausage and peppers and not that many beans. 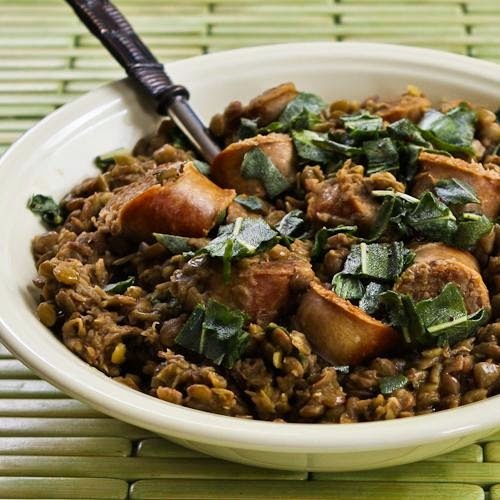 I love the crispy sage in this Sausage and Lentils with Fried Sage. 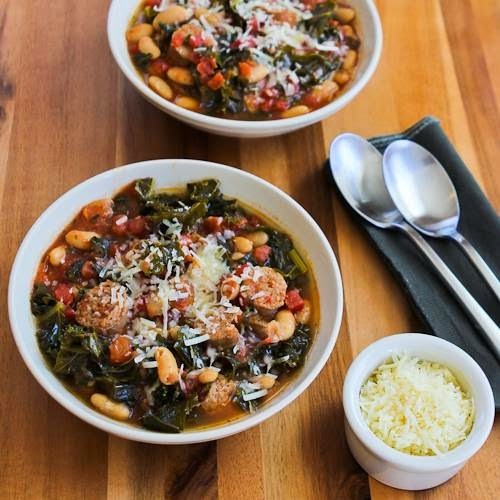 Slow Cooker Cannellini Bean Stew with Tomatoes, Italian Sausage, and Kale is comforting and nutritious! 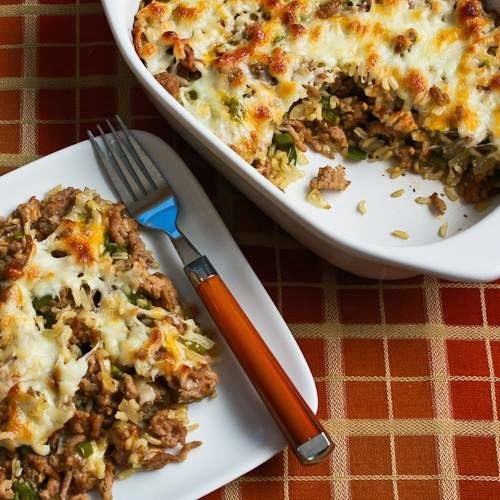 Easy Brown Rice Casserole with Turkey Italian Sausage and Green Pepper freezes well, and I love to pull this out of the freezer for a quick dinner. 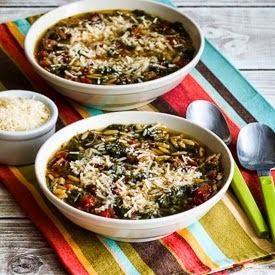 I love this Italian Sausage and Kale Soup with Whole Wheat Orzo, and if you don’t have orzo you can make it with broken whole wheat spaghetti. Stuffed Green Peppers with Brown Rice, Italian Sausage, and Parmesan have been one of the most popular recipes on the blog for years, and this has been pinned 400K times so you can tell it has a lot of fans! 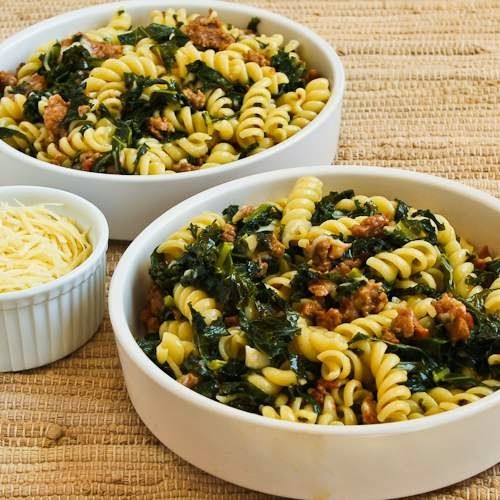 This Pasta with Hot Italian Sausage, Kale, Garlic, and Red Pepper Flakes is amazing for a quick meal. 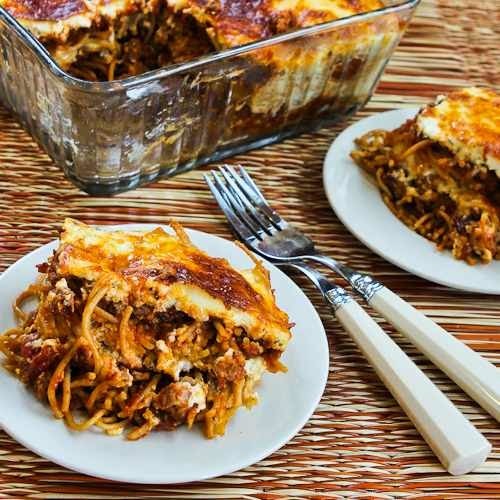 The whole family will love this Baked Whole Wheat Spaghetti Casserole with Turkey Italian Sausage and Mozzarella. 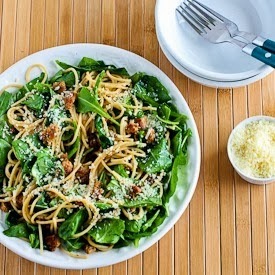 Spaghetti with Italian Sausage and Arugula is a dish I loved from the first time I tried it. I purchased the all the Jenni-O Italian Turkey Sausage used in these recipes myself and this company has no idea that I’m writing about their product. All items featured as Kalyn’s Kitchen Picks are things I will happily buy over and over, and because I want readers to know that my opinions are completely unbiased, I don’t accept review products from the many companies who offer to send them to me. You can see the complete list of products I’ve chosen to feature at Kalyn’s Kitchen Picks. I recently discovered the Jenni O spicy turkey sausage making it a substitute for ground beef in my spaghetti sauce. Was delicious and I bought some more, in search of inspiration for other things to make, I found your site. Tried the Brown Rice and Turkey Sausage…delicious! Whole family loved it. Was easy too =) Going to try one of the soups next, looking forward to trying them all in an effort to eat less red meat. Thank you! Thanks Lori; glad you have enjoyed it! Don't assume that kids can't eat spicy foods–my grandsons have loved hot wings since they were toddlers and dribble on lots of hot sauce now they are in elementary and junior high. When I first started cooking Chinese food, I remember preparing several fairly innocuous dishes and adding a half recipe of a very spicy tangerine chicken dish for my husband and me. By the time he and I got to the table, the tangerine chicken was gone and preteen kids were licking their chops and getting to work on everything else–it was the last time I ever held the chili peppers for anyone. Janet, lucky you if you have kids who like spicy food! This is my favorite of your turkey sausage recipes…Slow Cooker Chickpea Stew Recipe with Italian Sausage, Tomatoes, and Pesto – YUMMM!. Ellen, so glad to hear you've been enjoying it! I have to try one of those since you recommend them so highly. I'm low-carb but not low-fat so I never buy any turkey-this-or-that anything and just go with the real deal. Is there any reason that you like these so much other than that they're lower in fat and calories than the real pork sausage? Just wondering. Thanks for all your tips. You've been a God-send for me and my low-carb efforts. Elizabeth glad the low-carb recipes are helpful. I think in some recipes the amount of fat that drips out of the pork sausage gives an overly greasy result, otherwise I like pork sausage too. But these sausages are just so flavorful!